There are many, many pretty vintage sheets available on etsy. 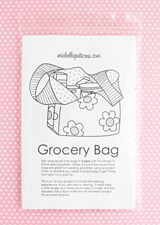 Someday I'd like to make a quilt from vintage sheets, use them to line a Grocery Bag, or maybe make an apron. I put together a treasury with some of my favorites. Stop by and take a look! They are available here and I only have 20 10 of them destash, so hurry over here. After that you can find these in the etsy supplies category. Before the year ends I need to do some serious destashing. First up is this length of Japanese cotton fabric from Yuwa. It is available here in my etsy shop. This is something that has been cut out for months, and when I found the pieces in my Zip Pouches file folder, I thought it would be perfect for adding one of the new pockets to the front. 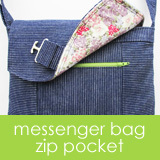 The pouch body was made using the tall size pieces from the Zip Pouches pattern and then the exterior pocket is #6 from the Curvy Patch Pockets. Maybe this weekend I'll work on sewing some of the other cut out pieces in this file. Today I have something new available--12 Curvy Patch Pocket templates that can be used to quickly add a cute and useful pocket wherever you need one (or more). I keep a file of these curvy pockets, and find it convenient to have a dedicated folder of pockets in a variety of sizes to fit different size projects/needs. Having an easy to find selection of pockets is making my sewing life easier. So I've put these 12 together into a one printable file that you can download and start your own pocket collection. This document has 3 slightly different shapes of curvy patch pocket with 4 graduated sizes of each style, so they'll fit a lot of different spaces and will come in handy for a variety of uses. Some are small card size pockets (#1 & #5) and others are big enough for phones, small journals, etc. Over time, the curvy patch pocket has become my favorite type of patch pocket, and now I almost always use it instead of a square patch pocket. The curved top makes them easier to slide things in and out, and the rounded edges give it a little style. These are cute enough to use on the outside of bags, or even on clothes. Instructions showing how I sew the pockets are included. Most of you don't need instructions, but there is one page detailing how I go about my pocket making. My scrap bin is literally bottomless. It may not be possible for me to use them all, but I do try. If you are like me and using up your scraps is a never ending adventure, these pockets can help you bust a move on your scraps. Plus, it's a fun surprise to have a pocket in a different fabric on the inside of bags, and it can make them easier to spot. Take it a step further and make some patchwork pockets. These are some of my favorites. A patchwork pocket can add a really fun surprise to the inside of a bag! Here is a peek of a patchwork pocket (Curvy Patch Pocket #1) inside a pouch made using one of the Zipper Pouches templates (#3). 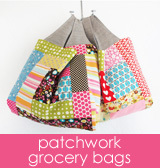 If you new to patchwork, and still getting comfortable pairing colors and prints, these pockets are good practice. Or if using patchwork on the exterior of project isn't totally your style, you might find a pocket is a great way to incorporate this colorful sewing art into some of your work. As you can see, I like to sew my label directly into the patchwork piece. These are the labels I use and there are other similar ones available in the etsy supplies category. You could also have your logo printed on fabric at Spoonflower, and probably get quite a lot of labels out of a 1/2 yard or 1 yard of fabric. You can also add a pocket on top of a pocket! This is a neat way to combine a smaller card size pocket with one of the larger pockets. This is pocket #5 on top of #8 and I used in inside a pouch for my large Moleskine Cahier journal (I used the medium size pouch pieces in this document). The larger pocket is deep and good for pens and the smaller pocket is for my business cards. Keep in mind that this technique is best for a small card pocket on top of another pocket. Once you put things inside the top pocket it will start to limit how much can fit inside the bottom pocket.